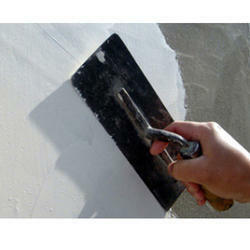 We are a leading Manufacturer of ryot4 ex wall putty and plaster putty from Thane, India. Ryot4 Ex Wall Putty is water resistant Exterior wall putty which provides protective coat for external surfaces. It is white cement, mineral, polymer & special additive based putty to confer long term protective and decorative properties to concrete and masonry surfaces, that need fortification from severe tropical condition during rain strong sun light and high humidity. We are instrumental in manufacturing and supplying high quality wall Plaster Putty that is known for its smoothness and eco-friendly nature.